The Elizabeth Glaser Pediatric AIDS Foundation is a 501(c)(3) non-profit organization. For further information, call 1-888-499-HOPE. Federal tax laws require us to provide you with a good faith estimate of the tax-deductible portion, if any, of your payment (the amount your payment, less the fair market value of the goods you receive). Because the purchase price of this item is not more than its retail price, no portion of the purchase price is deductible as a charitable contribution. However, any optional donation made in addition to the purchase price is tax-deductible to the full extent allowed by law. SPECIAL OFFER: For a limited time only, download the full-cast production of I Love Lucy: The Untold Story (Gregg Oppenheimer's comedy based on Laughs, Luck...and Lucy) for just $2! Get your copy of Laughs, Luck...and Lucy NOW, RISK-FREE,with ALL PROCEEDS TO CHARITY! Full of never-published Lucy scripts and photos! 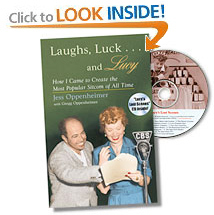 First Free Bonus: Your copy of Laughs, Luck...and Lucy will be personally autographed by Gregg Oppenheimer. Third Free Bonus: You'll also receive an exclusive, limited edition "Vitameatavegamin" bookmark! If Laughs, Luck...and Lucy doesn't quickly become one of your favorites, simply return it in new condition for a FULL REFUND! 100% of the purchase price for your autographed copy of Laughs, Luck...and Lucy benefits the Elizabeth Glaser Pediatric AIDS Foundation — the leading national non-profit foundation supporting critical pediatric AIDS research worldwide. Or get the Kindle edition for the incredibly low price of $2.99! See what's on the CD! "Wonderful! I never wanted it to end!" "This book is amazing! " "A must-have for true Lucy lovers." "Thoroughly enjoyable. A revealing glimpse into the world of radio and TV comedy and an eye-opening look at the creation of I Love Lucy." "A rich entertainment resource. Actual TV scripts . . . and a CD with audio excerpts from both I Love Lucy and its predecessor radio show, My Favorite Husband." "A first-hand account of American broadcasting history . . . . delivered in the engagingly humorous idiom of the most influential TV comedy writer of his generation." "Intimate glimpses of the world's favorite redhead -- and of a bygone era as wide-eyed and irrepressible as Lucy herself." "Great reading. The biography of a creative and funny man, a textbook on writing scripts and producing a television series, [and] an insider's guide to the entertainment industry." "I just love this book (and CD). What a great gift!"